This week I’ve actually been able to carve out some pieces of time to sew. I’m trying to finish all the projects I had started or have bought fabric for in the past 3 years. 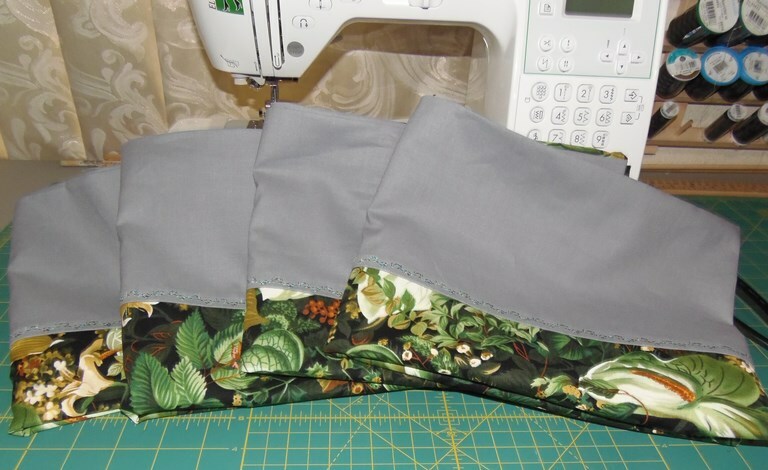 Yesterday I made 4 pillowcases; today I made the other 4 pillowcases. I finished the tote bag that needed handles and next I’m going to make the valances for my home office window. 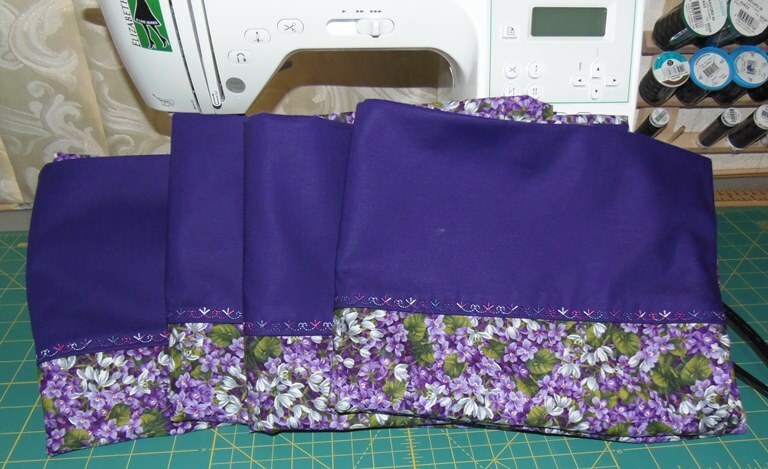 I found some beautiful purple satin fabric with embroidered butterflies on it. Since I love both purple and butterflies it was a no-brainer, however, they only had 2 yards of it left. Of course, I bought it all and am now hoping I can make it work for the pattern I have in mind. Other than that, I went to jury duty on Monday and was there most of the day but I didn’t get selected for a jury and only had to call in every evening to see if I were needed for the following day. I never did get called then got released on Thursday night. So much for the drama of the court! The dogs are all doing well though I sometimes feel like a pharmacist as I pass out pills, liquids in syringes and apply various ointments twice per day. Two weeks ago we found out that Keira has demodex mange so we are treating that daily and it seems to be responding to treatment, slowly but in a positive manner. Buffy’s skin infection is proving just as difficult to cure as the first time she had it last year. She’s on the 3rd antibiotic and it doesn’t seem much, if any, better. We are giving Gino and Dusty tummy meds twice per day. Maximus takes Prozac twice a day. Jolie takes Lasix and Themophyline twice a day. Buffy takes Rimadyl and her antibiotic (and I give her glucosamine for her joint pain); she was on an oral antibiotic, too, but has finished that one. Keira takes meds for the demodex every evening. Then, before bed Jolie has a nebulizer treatment. If she’s having a bad day we’ll do more than one treatment. If it’s terribly acute she has a narcotic liquid cough suppressant but we try to stay away from that if we can. Did I leave anyone out? I’m glad everyone doesn’t run out at the same time or I’d have to go back to work just to keep up! Anyway, I’m enjoying my retirement immensely except for these little concerns. And I’d have the same canine concerns if I were still working; I’d just be exhausted at the same time just like I was for so many years. I will be retired 7 months on the 29th of May and I think sometimes that I get happier the longer I’m free. We are taking estimates for some tree removal and landscaping in the front yard. Hopefully that will get accomplished some time in the coming week. I’m going to take before and after photos (did you expect ME not to take pictures? LOL). However did you find time to work honey? You’re such a busy, busy lady! !